Join Certified Zentangle® Teacher Rosie Hill at Coos Art Museum on Saturday, October 27, 2018 from 1:30 pm to 3:30 pm for “Fanciful Flowers, A Zentangle Class” Learn some new tangles and tangle variations that work together to make fun and fanciful flowers. 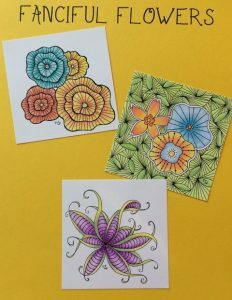 We will color the flowers with Prismacolor colored pencils and then learn a technique that soften and blends the colors to give them the look of watercolor. Participants are to bring Micron 01. All other materials are included in class fee. Zentangle books and other supplementary materials will be available for purchase. Teens and adults of all skill levels are welcome. Class size is limited to 12 participants. Class Fee: $30 CAM members / $35 non-members. Registration ends October 27, 2018. For registration go to www.coosart.org or visit Coos Art Museum at 235 Anderson in Downtown Coos Bay.